What is up everybody? Welcome back to 7800 Avenue! I have a very special guest with me, the new and improved, short-hair Kendra. So today we are going to play Kangaroo! It’s been a long time coming, and today we are actually going to play it. Are you ready to play Kangaroo? Let’s do it! 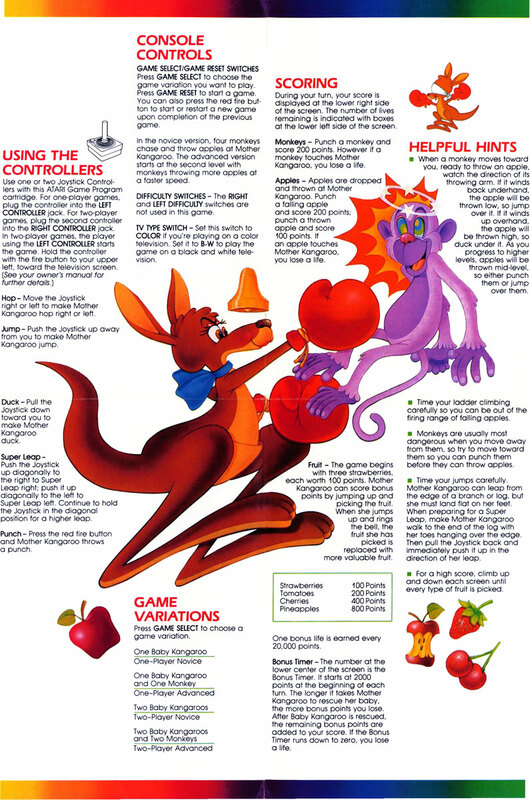 Kangaroo for Atari 2600! In the early 80s Pac-Man and Donkey Kong were the kings of the arcade, so what naturally followed was a slew of games that tried to capitalize on their gameplay. Lots of maze type games where you ate dots or the new style of platforming games which Donkey Kong brought to the table. It was a craze to say the least, everything was about the arcade – cartoons, plush toys and cereal, you couldn’t get away from it. Not only were arcades cabinets in every pizza parlor around town but they were literally popping up everywhere. I remember them being in drugstores tucked in a dark corner of the store. My mother took a Jazzercise class at the local rec center, and there was a Donkey Kong Junior cabinet off to the side. The Sears Outlet Store had a closet emptied out and inside were Dig Dug, Crystal Castles, and Zaxon cabinets, and only source of light came from the cabinets glow itself. And our local supermarket, Stater Brothers had a Missile Command and Kangaroo cabinet at the end of the checkout line right next to the Stanley Steamers that you could rent. I distinctly remember waiting for my mom to check out and going over to those cabinets, running my fingers across the Missile Command trackball and getting them pinched on the side, staring at the cartoon art that drew me in on the Kangaroo cabinet. Every once in a while my mom will give me a quarter for Kangaroo and I remember one of two things. Number one, it reminded me a lot of Donkey Kong, like there was something similar about it. Number two, that quarter would not last very long. This is an extremely hard game, and when you’re a little guy just trying to figure things out, that quarter was gone in a flash. It’s funny because I can still look back at all of the restaurants we used to eat at, or the places we would visit and I can distinctly remember what arcade cabinets were in each establishment. It’s easy to take things for granted now but there was a time when a place like Straw Hat Pizza got a brand-new arcade cabinet and we all became very excited and couldn’t wait to become the high score champ. Oh and if you’re wondering if I remember what cabinets were in Straw Hat Pizza – OutRun, Paperboy, Joust, Contra, and Williams High Speed Pinball. Side note about Straw Hat, we were there the night the Michael Jackson’s video for Bad had its world wide premier on CBS. Everything pizza, OutRun and Bad… not bad for an August night in 1987. Alright, so we played Kangaroo, we finally got to play it together. It’s hard man. It is SO hard. Now here’s the thing that burns me about this game. Any game that has up as jump – is a real problem. I do not like that at all. Give me two buttons. A jump, and a punch. Any time you start getting, you know, “Up is Jump”, forget it, I’m out. No good. Well that was Kangaroo on Atari 2600! I want to thank Kendra for being here in our episode today. Join us next time on 7800 Avenue! And check out Lynx Lounge and Jag Bar, those are great shows and we do it all here in the new studio and talk about some really great Atari games. See you on the next episode of 7800 Avenue! Kangaroo was programmed for the 2600 at Atari, and was developed by Sun Electronics.